I had a thought the other day that I ended up putting onto twitter. I’ve been thinking a lot lately about my depression and where it leads me, and one thing that I’ve noticed is that I start thinking about getting tattoos when I’m starting to wonder what things would be like if I weren’t alive anymore. (I’m not thinking about killing myself right now–no one needs to worry about that). I’m sure there’s a Freudian perspective that for me getting tattoos is an expression of death drive, and that’s probably true to a certain extent. Getting tattooed is an exercise of extended pain (though very bearable), and it is ‘technically’ a mutilation of my body. But not all mutilations are bad. For the record, I sitting here thinking that ‘mutilation’ isn’t the best word, but it’s better than ‘defacement’ or anything that passes a strong value judgement on the act. When I say ‘mutilation’, I’m just meaning that I am causing physical damage to my body in such a way that it changes its appearance. Hello, tattoo. Getting tattoos is about making certain parts of my identity visible when they might not otherwise be. 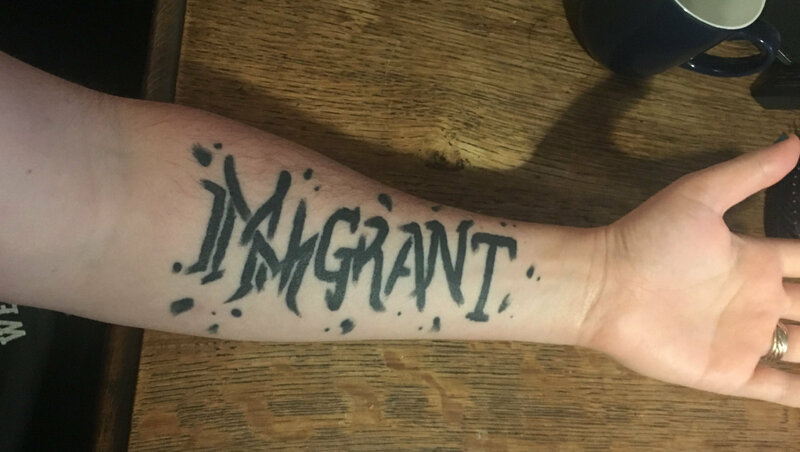 On my left arm, I have the word “IMMIGRANT” scrawled out in some combination of arte-nouveau and graffiti script. 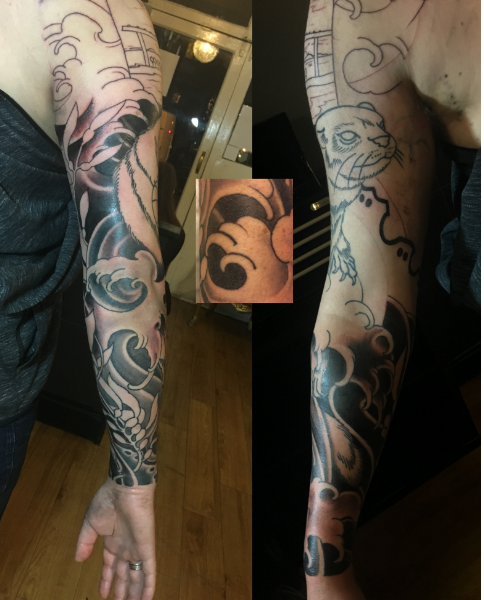 On my right arm, I have a sleeve in progress filled with images from my home. It’s still going, and is being done by the really great Jesse Rodriguez. Where some might say that this is a death drive manifesting, for me it feels like the images bind myself into my body. And when I’m in a moment when I’m not feeling all that attached to it and like it might be better if I treated it as disposable, the tattoos give me tangible reasons to love it. And yea. It might be better if I didn’t have to have augmentation to feel like it’s worth sticking around, but on the other hand… it doesn’t feel all that external. The tattoos act as a reminder that my identity is bound in this material existence1. And they bind me to my matter. I have an image of my head of a few layers of fabric, lain on top of each other, and able to slide back and forth. When I go off and start thinking that it might be better if I were dead, it’s as if the top layer of fabric is sliding off the table. The tattoos are like embroidery that makes a pattern on the bottom fabric visible on the top layer, and that bind the two pieces of fabric together in important points. Maybe they move less, but also, it makes something that was hidden apparent, and lends a lot of strength at that binding point. I think in the end what I’m trying to say, is that my tattoos make me feel stronger.